We pride ourselves on caring for your beloved pet with compassion and conscientiousness. We know that communication is very important for you, so we strive to clearly explain what is occurring and to involve you in the decision-making process. Our philosophy is to pursue a diagnosis, whenever possible, in order to be able to offer you a clear prognosis and the best possible available treatment. We aim to perform a high level of medicine and diagnostics. We also perform surgery in our hospital. With our own pharmacy and laboratory on site, we can rapidly provide you with a diagnosis and an appropriate treatment. 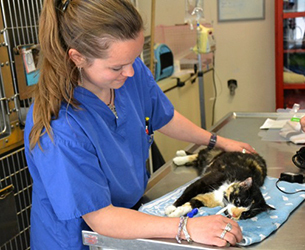 Althought we can perform most procedures in our practice, we do not hesitate to refer when necessary, in order to offer you the best possible available care for your animal. We are open on Saturday morning and we participate in the Geneva after-hours emergency service.